After contributing as much as $150 million to Republican campaigns and causes to become the top GOP political donor this year, Las Vegas Sands Corp. Chairman Sheldon Adelson isn’t putting away his checkbook. Instead, the billionaire casino magnate has vowed to double his contributions during the 2016 wide-open White House contest, becoming an unparalleled political power broker courted by Republican leaders on Capitol Hill and presidential hopefuls alike. Adelson’s millions also may help rebuild the Republican Party in Nevada and finance efforts to reach out to Hispanics, a key voting bloc, GOP insiders and fundraisers say. 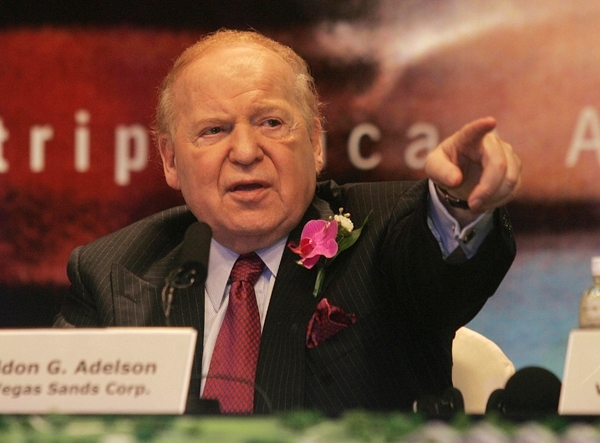 “By the time 2015 rolls around, Adelson will probably be on a first-name basis with every Republican candidate serious about pursuing the nomination,” said Jennifer Duffy, an analyst with The Cook Political Report. Indeed, this year Adelson and his wife, Miriam, had become first-name friendly with GOP presidential nominee Mitt Romney and his wife, Ann, as the Las Vegans gave $30 million to a political action committee, Restore Our Future, that backed Romney’s campaign. Adelson, a passionate supporter of Israel, attended a foreign policy speech Romney gave in Jerusalem last summer. And the Sands boss met Romney in private several times in Las Vegas. “I don’t know how it is that Sheldon Adelson got in the front row,” Romney joked at a private $1 million fundraiser on Sept. 21 at Red Rock Resort. Behind the scenes, Adelson also met with Romney’s running mate, U.S. Rep. Paul Ryan of Wisconsin, who could be a presidential candidate in 2016. And the political kingmaker chatted with U.S. Sen. Marco Rubio, R-Fla., who campaigned in Las Vegas for Romney and is a potential 2016 White House contender. At a post-election Republican Governors Association convention in November, state leaders paid their respects to Adelson while meeting at The Venetian, his hotel-casino on the Strip. Governors who visited Adelson included Bobby Jindal of Louisiana, John Kasich of Ohio, and outgoing Gov. Bob McDonnell of Virginia. Adelson, in turn, made the rounds last week on Capitol Hill, seeing leaders of GOP campaign committees as well as House Speaker John Boehner, R-Ohio, and Majority Leader Eric Cantor, R-Va.
U.S. Sen. Dean Heller, R-Nev., also had a “courtesy call” from Adelson, whose wife and family contributed at least $35,000 directly to his winning Senate campaign, according to Federal Election Commission records. Separately, Adelson gave $23 million to American Crossroads in the final weeks of the campaign. He also gave generously to Crossroads GPS and Americans for Prosperity, two nonprofit groups that, like American Crossroads, ran ads against Heller’s opponent, U.S. Rep. Shelley Berkley, D-Nev. Unlike PACs, the nonprofits don’t have to report donations. But Adelson gave $30 million to $40 million to Crossroads GPS and at least $15 million to Americans for Prosperity, the Huffington Post has reported. Giving until the end, Adelson and his wife donated $40 million to GOP super PACs just before Nov. 6, according to FEC reports, bringing their total reported donations to $90 million. The Huffington Post reported the Adelsons gave $150 million in all, including unreported money. An Adelson spokesman wouldn’t confirm the figure. Whatever the total, Adelson told the Wall Street Journal in his first post-election interview that he would contribute twice as much next time. That’s spoken like a true gambler, in this case on politics, not on the casino floor where the odds are always against high rollers and hustlers alike – a fact that’s helped make Adelson’s net worth grow to $20.5 billion, according to Forbes magazine. That makes him the 12th richest man worldwide and seventh richest in America. Charles Spies, treasurer and founder of Restore Our Future, said donors were “disappointed” that Romney didn’t win but understoood that record spending kept the race close. After the election, Spies and former U.S. Commerce Secretary Carlos Gutierrez and other GOP leaders created a super PAC called Republicans for Immigration Reform to push for change and appeal to Hispanics. Latinos are a growing demographic in the United States that Republicans have been losing. Adelson would likely contribute. Also, Adelson, Steve Wynn and other big donors on the Strip are discussing contributing to an effort to strengthen the Republican Party in Nevada, possibly through a new organization separate from the party structure that would register voters, identify supporters and otherwise counter robust Democratic efforts. “It would be a good use of his money and would produce lasting results,” Duffy said, although she suggested it would be wiser to rebuild the party instead of going around it. Adelson’s efforts this year failed to defeat President Barack Obama, but his cash contributed to Heller’s victory and helped GOP candidates win several legislative seats, although not enough for the party to take control of the Nevada Senate. Nationally, Adelson donations were largely wasted on losing campaigns. Another difference: The Adelsons initially backed Newt Gingrich, giving $15 million to a political action committee to become his biggest backer until he pulled out of the race. Adelson then spent heavily on behalf of Romney. That willingness to donate big, early and often makes Adelson highly popular in GOP circles. Adelson, like many businessmen, doesn’t want his taxes to go up, which aligns with current GOP policy. His opposition to online gaming is also notable, though Nevada’s congressional delegation and the gaming industry in general are pushing for it, so he might not have much sway in the matter. “I think he wants to become a de facto anointer of Republicans,” Peplowski said, adding that Adelson’s political activism also helps “legitimize his casino empire within the Republican caucuses.” The causes close to Adelson’s heart were apparent in a review of donations that didn’t make headlines. The Adelsons contributed $1 million to the Patriot Prosperity PAC, which backed the losing campaign of Shmuley Boteach, an American Orthodox rabbi, author, TV host and unofficial spiritual guide to the late Michael Jackson. Boteach ran for Congress from New Jersey as a Republican. The Adelsons also contributed $10,000 directly to Boteach’s congressional campaign. In mid-October, the Adelsons gave $2 million to Protecting Michigan Taxpayers – a group that helped defeat a ballot initiative that would have enshrined collective bargaining rights in the state constitution. Adelson has said that Democratic support for unions made him switch to the Republican Party in the mid-1990s. The Venetian is the Strip’s only non union hotel-casino. The Culinary union worked to elect Berkley this year and used anti-Adelson mailers as part of its campaign. Stephens Washington Bureau reporter Peter Urban contributed to this story. Contact Laura Myers at lmyers@reviewjournal.com or702-387-2919. Follow @lmyerslvrj on Twitter.